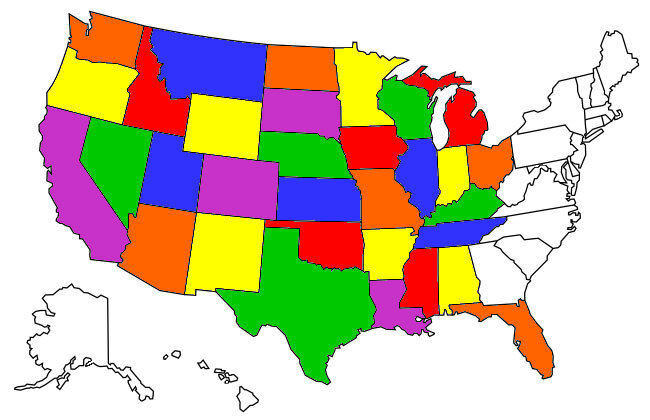 I've come to discover that owning an RV is a continuous improvement process. It seems every time I go camping something occurs to suggest improvements or additional desirable capabilities. I have rediscovered the fun of mountain biking. Even though my bike is a Wally World "Special" it's still fun and great exercise. My first couple camping runs I put the bike INSIDE the camper to transport it. 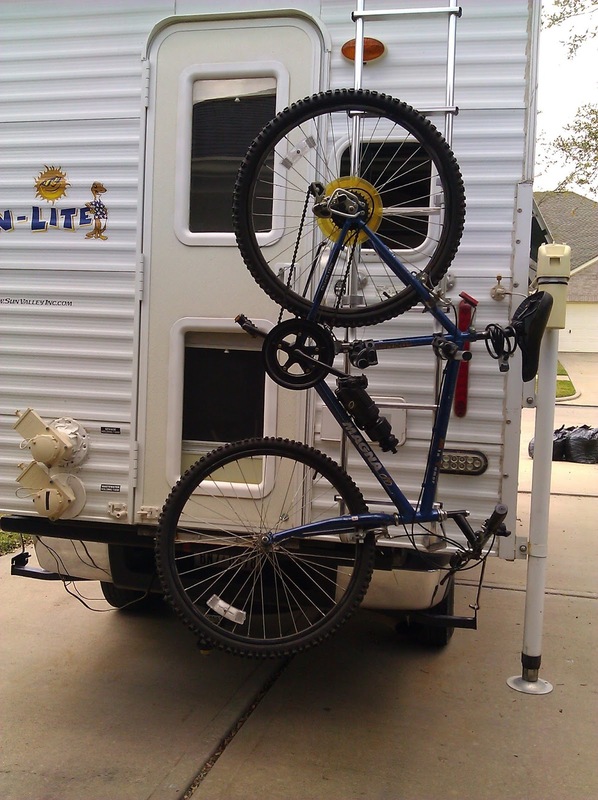 I wised up and installed a ladder bike rack that can hold two bikes if needed. And I can still open the camper door! 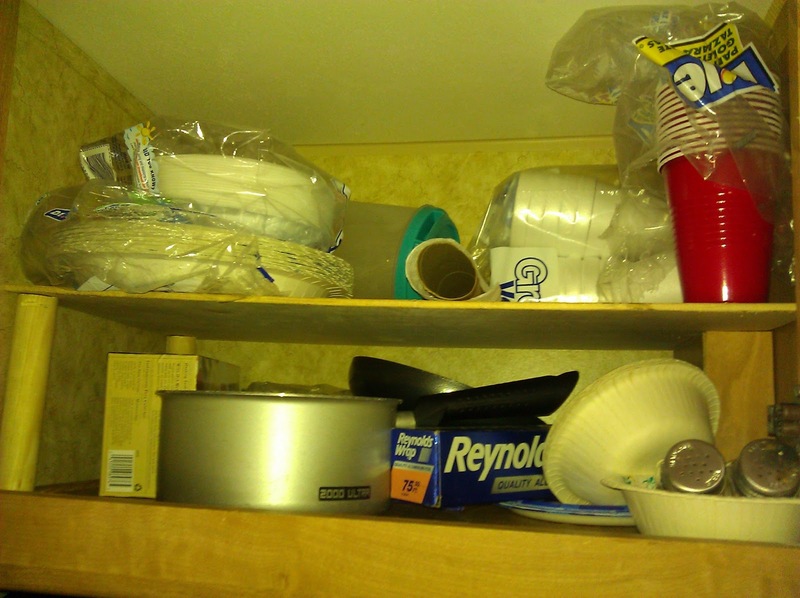 The camper has a compartment that is designed to hold a microwave over the stove top, there's a outlet inside for plugging it in and everything. I decided to forgo a microwave and thus far haven't missed one. Since cabinet space is at such a premium I put a shelf in the compartment that effectively doubles the "square footage" of it's capacity. It comes out if I wimp out and decide in favor of the microwave. 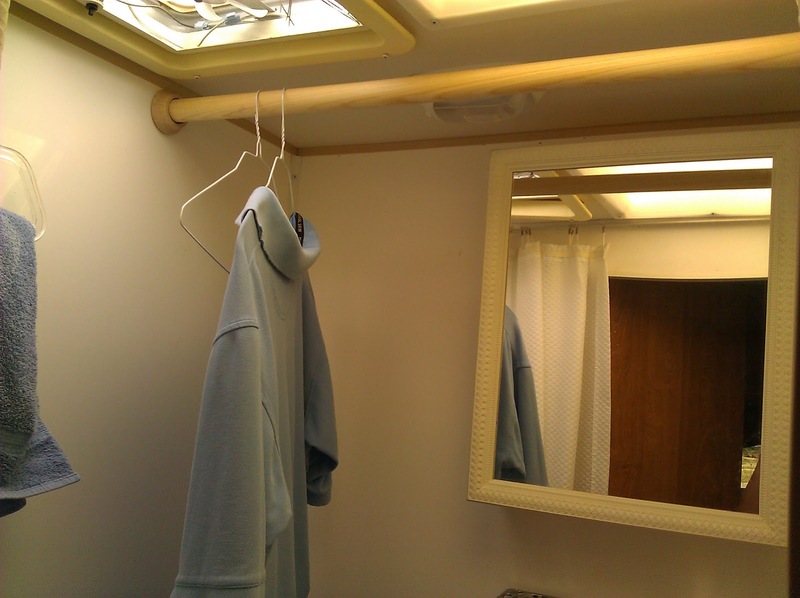 The closet in the camper is all of six inches wide. To increase the hanger capacity I put a dowel rod in the bathroom that increases hung clothes capacity by about 500%. A place to hang all my suits and dinner jackets! On the truck side of things, the camper weighs 2200 lbs "dry". The Silverado can carry 3600 pounds so there's a lot more load that potentially would be attempted to be controlled by the springs and shocks. Going down the road the pickup would "porpoise" up and down after encountering dips when under full load so I had Roadmaster Active Suspension installed in the back of the truck. 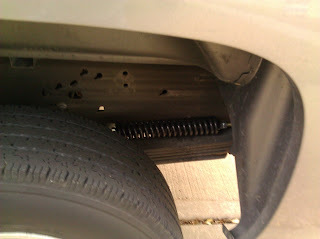 It's a really strong coil spring that sits on top of the leaf springs that "pulls" them back quickly when they flex. Bye bye, Flipper....no more porpoising! Finally, off subject but please meet my friend Becky. 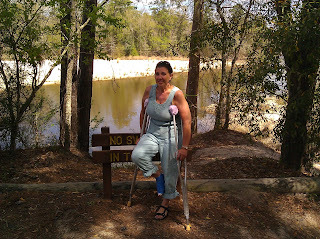 Weeks ago Becky (an avid camper) committed to camping over Spring Break at Valley Creek SP north of Beaumont with me. Then she had to undergo a operation on her foot and so you'd assume that, like a sensible person, she'd have canceled, right?